Princesses and Pixie Dust: Food Friday: Almost There? Inevitably, there will be a day when you're watching The Princess and the Frog (for the seven-hundredth time) and, while admiring Princess Tiana's effortless preparation of delectable delicacies, think, "Hey- I could totally do that!". Okay, in this particular situation, "you" is "me", and the day was this past Tuesday, when I was inspired by Disney's queen(-to-be) of the kitchen to do some experimenting of my own! Into the pantry I ventured, surveying the area for ingredients that could become treats fit for a frog-prince. 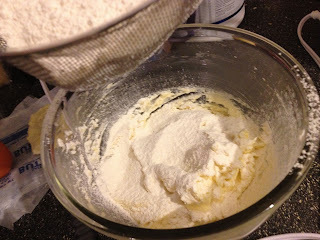 After quickly deciding that recreating those famous man-catchin' beignets might be a tad ambitious (the word "kneading" strikes fear into my little baking heart, and I'll spare you the tales of my unfortunate deep-frying experiences... I don't want to talk about it. ), I opted for the simpler, tried-and-true sugar cookie. The ultimate plan was to shape them into bows and Mickey-heads (silhouettes? Hidden Mickeys?) and adorn them with copious amounts of icing and adorableness. The cookies began like any others with room-temperature butter, which I set out on the counter to soften nuked in the microwaved, and creamed with yummy, yummy sugar. Per the norm, egg and vanilla came next. I then completed the optional step of making my little sister a peanut butter sandwich so she would stop eating the batter. This is where things start to get dicey, so I'll take you through a little bit of step-by-step journey, accompanied by visual aids (read: poor-quality iPhone photos) for your enjoyment. Stir together the dry ingredients (flour and salt), then SIFT them into the butter because this recipe is turning out to be far more high-maintenance than you anticipated. Add milk. 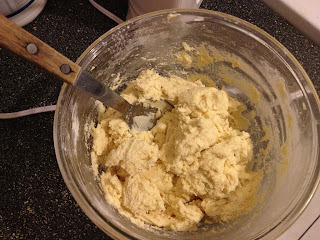 Stir the batter by hand, unless you have one of those fancy-schmancy stand mixers (you lucky duck, you), until you cannot possibly stir anymore. Chill dough for at least two hours. Also, remind yourself to just buy the pre-made stuff next time. Cookie dough, you have been far more trouble than you're worth. Okay guys, now, if you have Mickey Mouse cookie cutters, you're home free. Roll that sweet stuff out, make some shapes, pop 'em in the oven, and go nuts. If you're me, try to cut the shapes out with a paring knife, fail miserably, and (after shaping a few Mickeys yourself) throw some cinnamon and sugar in a bowl and make Snickerdoodles instead. Let's not tell Tiana about this one, okay? What Disney treats are your favorites to make (or eat)? Next week, I'll be attempting to recreate my favorite snack from the Magic Kingdom- any guesses?